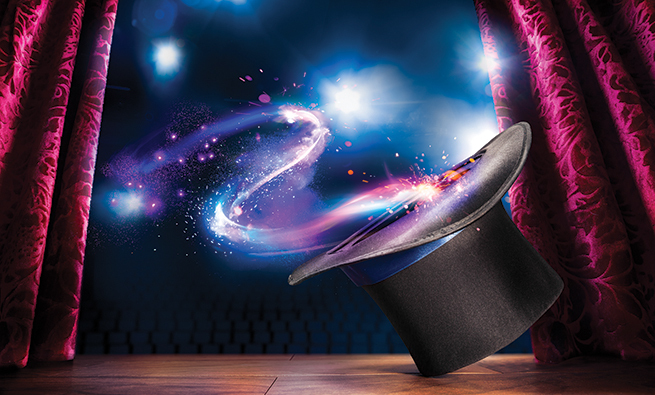 “The Power of Intangibles” by Gary Cokins and Nick Shepherd in the May 2017 issue of Strategic Finance provided a call to action to management accountants to understand intangibles and their relationship to value creation. In addition, the September 2017 article on “Sustainable Development Goals” by Cristiano Busco, Giovanni Fiori, Mark Frigo, and Angelo Riccaboni further illustrated the need for management accountants and organizations to strive for “performance with a purpose.” As a follow-up to those articles, we would like to further strengthen the case for the importance of intangibles by briefly addressing the supposed dichotomy between nonfinancial metrics and financial value by presenting empirical studies that show a clear link between intangibles and value. Furthermore, we present a real example from Japan that illustrates the power of intangibles by taking a closer look at sustainability initiatives championed by Eisai Co., Ltd. (hereinafter referred to as Eisai Pharmaceuticals). Then we offer some practical tips for management accountants seeking to steer their company strategically toward intangibles for value creation. Since both the Cokins/Shepherd article and the International Integrated Reporting Council (IIRC) suggest that approximately 20% of corporate value is related to the value of physical and financial assets, with the remaining approximately 80% being related to the value of intangible factors, our hope is to encourage management accountants to increasingly focus on the 80%. 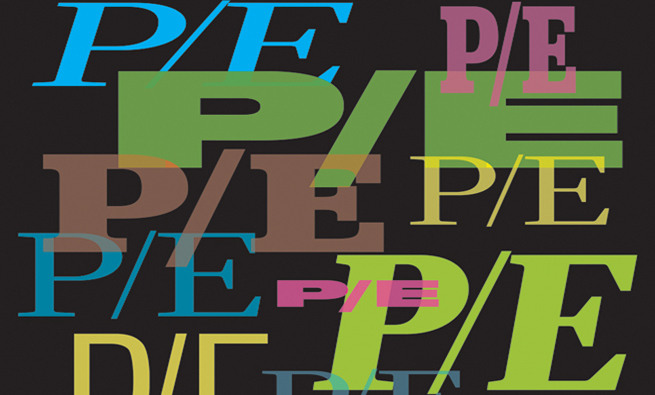 CAN ESG/CSR MEET INVESTORS’ EXPECTATIONS FOR FINANCIAL VALUE? The adoption of integrated reporting and sustainability metrics has generally lagged in the United States. In contrast to U.S. companies, Japanese companies have been pioneers in adopting nonfinancial metrics—i.e., intangibles. In Japan, Environmental, Social, and Governance (ESG); Corporate Social Responsibility (CSR); and nonfinancial information reporting are booming now with nearly 300 listed companies already adopting integrated reporting. Traditionally, Japanese corporate managers are inclined to tout their companies’ intangibles, such as human resources and social contribution, rather than financial metrics like earnings per share (EPS) and return on equity (ROE). This tendency to report intangibles could be due to the traditional Japanese value of collective capitalism deeply rooted in an insular, groupism culture and history instead of an emphasis on individual shareholder primacy as in the U.S. 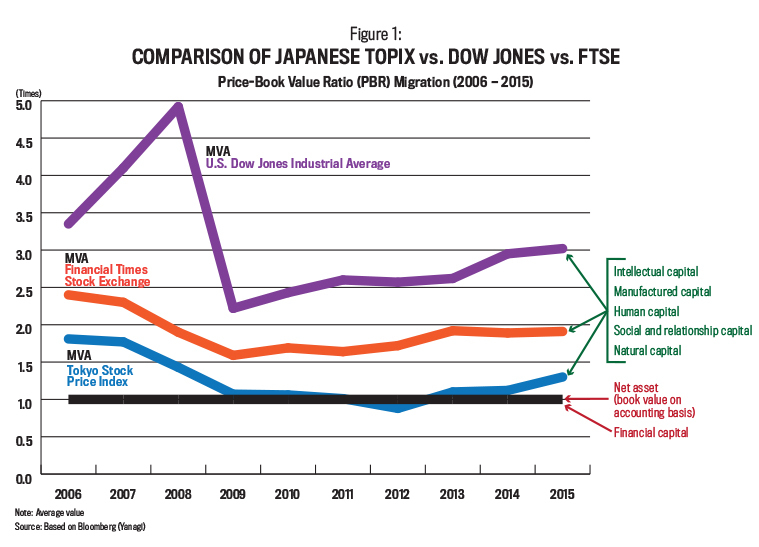 In recent years, however, the problem at Japanese companies has been that Japan’s price-book value ratio (PBR), or market capitalization to equity book value, has been stagnant and hovering around 1—i.e., without meaningful market value added (MVA), which is market capitalization minus equity book value. If we assume that financial capital is related to the net assets side of the PBR equation while nonfinancial capitals are connected with the market capitalization or MVA side of the PBR equation, then we would assume that Japan’s emphasis on intangibles will result in greater MVA and a PBR significantly higher than 1. As you can see in Figure 1, however, if we compare the Tokyo Stock Price Index (TOPIX), which calculates the stock price index of all the Japanese companies listed on the first section of the Tokyo Stock Exchange, to the U.S. Dow Jones and the Financial Times Stock Exchange (FTSE), MVA of the U.S. companies is much higher. Why is there an apparent lack of value creation by Japanese companies despite their allegedly affluent intangibles? In addition to this dichotomy, there is also the issue of the investment community’s continuing emphasis on pure financials. Part of this dichotomy can be explained by “bank-led governance” in Japan exemplified by infamous “cross-shareholdings” that incurred a significant “corporate governance discount” with persistent effects on valuation in the past. The historical background of bank-led governance could be traced to the devastation Japan faced after World War II that resulted in no equity capital providers. The Japanese government then took the lead and offered lending via banks to revitalize the economy, which resulted in rapid economic growth. But this model was based on cross-shareholdings between banks and companies, thereby stifling the rights of genuine minority shareholders. This is one explanation for the Japanese historical tendency for corporate managers to ignore the shareholder rights and value. 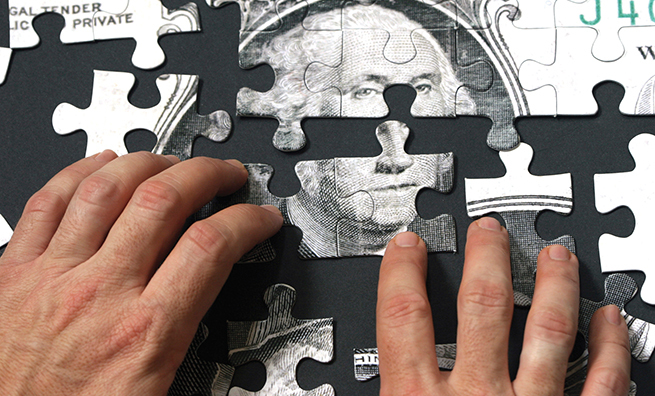 Lack of financial literacy explains the other part of the dichotomy. In a survey by the Japan Investment Relations Association (JIRA), “IR Survey 2017,” 55.9% of companies that engage in investor relations activities point out that “disclosing and explaining non-financial information in connection with corporate value” is a challenge. Thus, the dilemma is how to explain the enigma of why Japanese companies have PBR less than 1 while simultaneously proving to the investor community that there’s value in CSR and ESG activities. 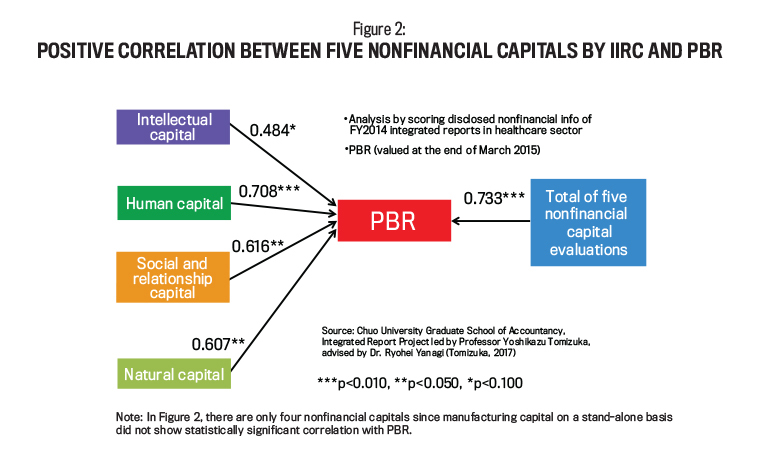 In contrast to the negative MVA shown by the graph in Figure 1, numerous empirical studies back the relationship between the IIRC-defined five nonfinancial capitals and PBR by showing a statistical correlation, including the cases of Japanese companies. We argue that there does seem to be a positive correlation between intangibles and value via MVA while keeping in mind that correlation doesn’t always prove causality. For example, a study conducted by Chuo University Graduate School of Accountancy, “Are Non-financial Capitals Connected with Corporate Value? Empirical Research on Japanese Healthcare Sector,” which analyzed Japan’s healthcare sector (see “Further Research”at the end of the article), found a significant positive correlation between the IIRC’s five nonfinancial capitals and price-book value ratio (IIRC-PBR model). Healthcare companies were chosen because the proportion of companies that refer to the IIRC’s Framework when compiling integrated reports in that industry is high. Furthermore, other research supports the use of the IIRC-PBR model by proving that the five nonfinancial capitals defined by the IIRC are related to market value added. One empirical study, “Relation between Human/Intellectual Capitals and Corporate Value (PBR),” (see “Further Research”) sampled Japanese companies across the board and showed that the more a company’s intangibles were formed from personnel (human capital) and research and development (R&D) (intellectual capital) expenses, the higher the company’s MVA. As you can see by the R2 value in Figure 3, the study found that more than 10% of MVA is explainable by R&D investment as intellectual capital whereas another 10% or more of MVA is attributable to personnel investment as human capital. This can be interpreted as significant and direct evidence supporting the IIRC-PBR model (positive correlation between nonfinancials and PBR). Our approach is to take the best of both worlds. We shouldn’t focus only on nonfinancials or on financials, but management accountants should make a bridge to both sides using what we call the ROE-ESG model. As mentioned earlier, corporate value can be represented by the price-book value ratio in a way whereby accounting value (equity book value) accounts for PBR equivalent to 1 and market value added indicates PBR above 1, representing value creation over nominal book value (net assets). Then we assume that MVA is related to nonfinancial capital or intangibles as evidenced by the results of the empirical research shown in Figures 2 and 3. 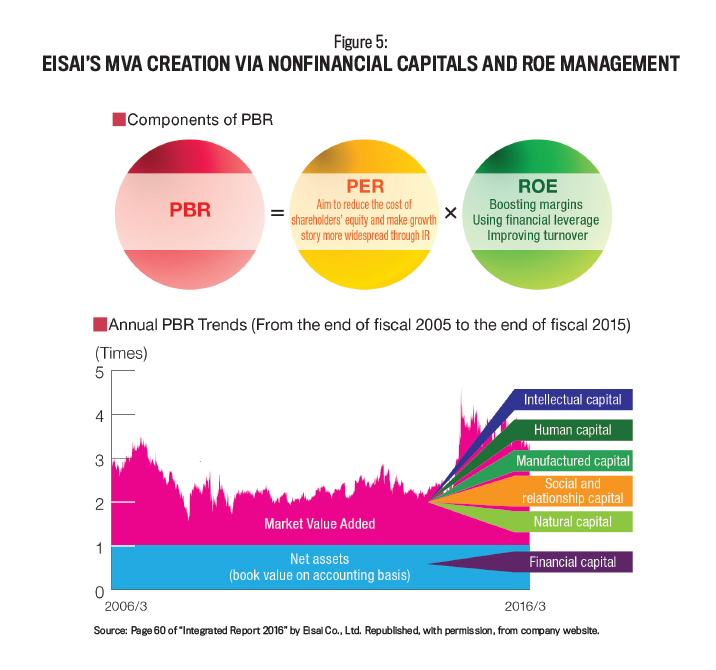 In accordance with the residual income model (RIM), MVA—or the portion that contributes to PBR equaling more than 1—is theoretically the function of future flow of ROE. Here’s another way of explaining this: Nonfinancial capital is the added value that management should create (i.e., goodwill or the hidden value) that can’t be accounted for on a financial accounting basis and is related to MVA. On the other hand, RIM indicates that shareholder value is the total of equity book value (BV) plus the sum of present value of future residual incomes (with its KPI as equity spread). Since equity spread is ROE minus cost of equity capital, theoretically MVA is a variable for future ROE. Therefore, ESG as nonfinancials or intangibles can be connected or synchronized with ROE via MVA on a long-term basis. Hence we call it the ROE-ESG model, enabling the win-win situation for both shareholders and companies bridging sustainability issues and projects with the more traditional financial accounting and shareholder reporting worlds. In order to see a concrete example of the ROE-ESG model in practical use, let’s take a look at the case of Eisai Pharmaceuticals. Eisai Pharmaceuticals is the fifth largest pharmaceuticals company in Japan (by sales in FY2016) with almost ¥550 billion in sales and 10,000 employees. Its main therapeutic areas are neurology and oncology. Even among Japanese companies, Eisai is considered to be an early adopter of ESG and CSR initiatives. 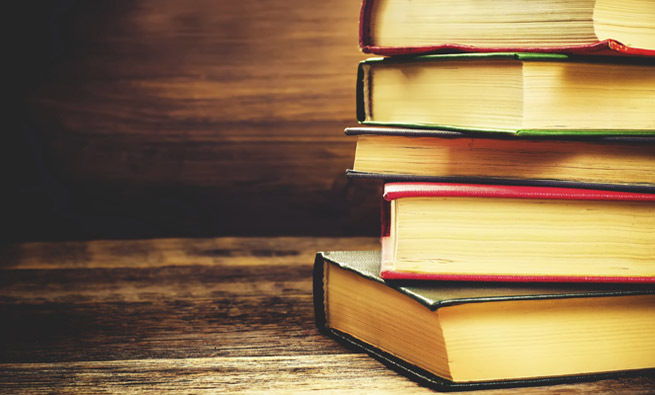 Its strategy was measured on a model that incorporates elements of the IIRC Framework and the balanced scorecard even before the formal announcement of the IIRC Framework. Building on its corporate philosophy called hhc (human health care), which places its first priority on patients’ satisfaction, Eisai pursues value relevance between financial capital and nonfinancial capital in consideration of capital efficiency (ROE and equity spread) and sustainability (the importance of social contribution, especially to patients). (See Figure 4 for how this works.) A review of Eisai’s “Integrated Report 2016” shows that the company is actively promoting intangibles such as diversity of its workforce, improving access to medicines (ATM), and preserving the natural environment. For example, in 2015, for the eighth consecutive fiscal year, the Eisai Group in Japan attained zero emissions, which is 1% or less in terms of the ratio of waste sent to landfill against the amount of waste generated. Eisai’s PBR has steadily exceeded Japan’s standard level of 1 because of its ROE management initiatives implemented along with the company’s growth strategy since the early 2000s. In other words, Eisai’s market value (total market capitalization) far exceeds its net assets on an accounting basis. That difference is again MVA, which has been created for Eisai by intangibles and ROE over the past decade (see Figure 5). In 2010, Eisai announced that it had entered into an agreement with the World Health Organization (WHO) to provide 2.2 billion Diethylcarbamazine (DEC) tablets for the treatment of lymphatic filariasis, a neglected infectious tropical disease transmitted to humans via carrier mosquitoes, free to patients in emerging countries until 2020. So far, more than 660 million DEC tablets have been provided to 23 endemic countries through the WHO program. This social contribution to access to medicines isn’t a donation and doesn’t stop at corporate social responsibility. It also acts as an aspect of “ultra-long-term investment” that’s accepted by investors and shareholders. In other words, it’s the combination of social value and economic value (CSV, or creating shared value). Following the IIRC model, Eisai explains the input, output, and outcome of this in its “Integrated Report 2016” (see Figure 6). This is indeed an attempt aimed at high-value-added management and is value creation through the S (social contribution) in ESG. According to Eisai CFO Ryo Yanagi, at first, as a project in the red, it was a negative factor on short-term profits and ROE since the company had to invest significantly by building a plant in India to manufacture DEC and other medicines. In the ultra-long term, however, net present value (NPV) can actually be calculated as positive through factors such as brand value in the company’s business operations in emerging countries, increased productivity, and improved skills and motivation of employees through higher production rates at Eisai’s India plant. In a sense, this is an ultra-long-term investment that’s both a win-win situation for patients and long-term investors and justifiable from a financial theory standpoint. This project is a concrete and holistic case of the nonfinancial capital (ESG) and equity spread (ROE) synchronization model in action and leads to increased ROE or corporate value as a long-term and delayed outcome. 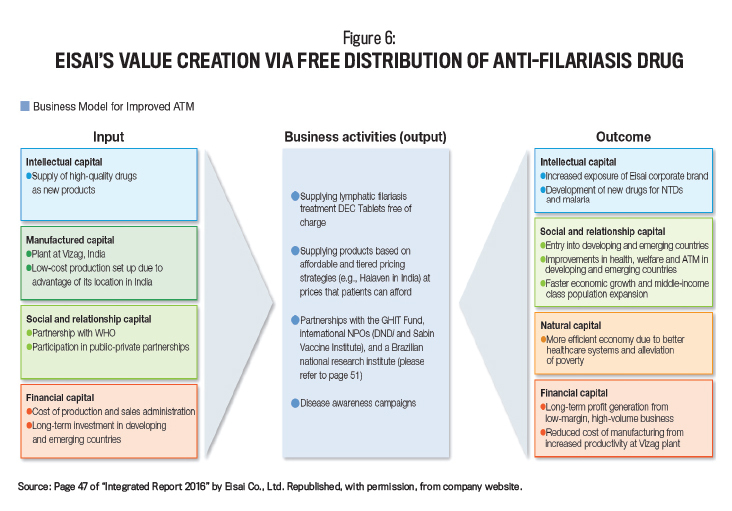 The concept is further explained in the following quote from Eisai’s press release in April 2017 when it reaffirmed its support for eliminating lymphatic filariasis: “Eisai seeks to contribute to the health and welfare of people in developing and emerging countries, as it considers this to be a long-term investment in creating the markets of the future. Once they have recovered their health, they can resume productive activities, which will in turn contribute to economic development and expansion of the middle-income class.” Expanding the middle-income demographic class will lead to longer lives and potential future patients for Eisai’s other drugs in the long term, which will increase the traditional financial metric of profit. Another example of Eisai’s ESG efforts is its contribution to research and development for a new treatment for eumycetoma with the international nonprofit organization Drugs for Neglected Diseases initiative (DNDi). Eisai has also been commended for its establishment of a global pricing policy and cofounding the Global Health Innovative Technology (GHIT) Fund. In recognition of such efforts, Eisai has been included in the Dow Jones Sustainability Index Asia (DJSI) for five years in a row from 2013 through 2017. In addition to the DJSI Asia Pacific, for the 16th consecutive year since 2002 Eisai has been selected as a member of the FTSE4Good Index Series, another global index for socially responsible investment (SRI). In 2016, Eisai also initiated a medium-term business plan called “EWAY 2015” to respond to the coming environmental changes to the global pharmaceutical industry as a result of the expansion of the middle-income class in emerging countries and the global aging of society. Keeping in mind its focus on patient needs and work with patients, the company created seven themes for the plan: “Patient-centricity”; “Prevention, Cure and Care”; “Regional Care/Home Care”; “Outcomes”; “Payers”; “Access”; and “Digital Technology.” It says it wants to become a frontrunner in the area of meeting patients’ needs. Where do management accountants fit in all these activities? Eisai CFO Ryo Yanagi offers some insights and recommendations to management accountants from his years of intensive experience in Investor Relations, Corporate Governance, and Integrated Reporting at Eisai. Create a financial strategy map focusing on return on equity with cost-of-capital consideration as evidenced by equity spread that will lead to market value added or price-book value ratio enhancement, and implement DuPont Analysis to be cascaded down to every business unit. The DuPont model (i.e., ROE broken down into margin x turnover x leverage) is a key performance indicator (KPI) for Eisai, and, as CFO, Yanagi streamlined operations to improve margin, accelerating collection of accounts receivables and slashing inventories to enhance turnover while utilizing debt moderately to optimize balance sheet leverage. Place importance on intangibles, not only for their social contribution but also as a future source of value creation, with priorities going to each company’s corporate philosophy as well as redefining concrete KPIs for nonfinancial information. Eisai’s hhc (human health care) vision mandates a patients-first approach with economic value given a secondary priority. 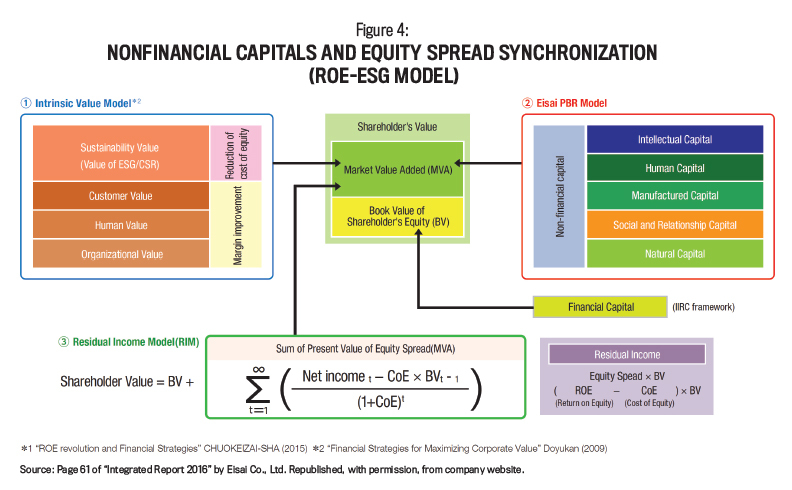 Formulate a “Nonfinancial Capitals and Equity Spread Synchronization Model” of your own to connect intangibles with financial targets, and use it to report to stakeholders for fiduciary duty and accountability in a bid to satisfy all the stakeholders at the same time. Valuation in PBR is related to ESG as we proved in our ROE-ESG synchronization model. Hence, at Eisai, Yanagi explains all ESG initiatives by presenting their link to value and the equity story in integrated reports and in tenacious and active engagement with global investors. The Investor Relations Team led by the CFO conducts about 700 investor meetings per year in the aggregate, thereby pitching the equity story of ROE-ESG integration globally. The team has seen that, by doing this tenaciously and consistently, the market has started to factor it in, and it has led to higher share price or higher PBR for Eisai. In this article we used examples from Japan to show how nonfinancial capital can be synchronized with long-term ROE. Thanks to the advent of social media, which raised awareness of the importance of branding and reputation, most companies have jumped on the ESG/CSR bandwagon. Yet many still view ESG and CSR projects as “politically or socially” necessary but not linked directly to real value creation. 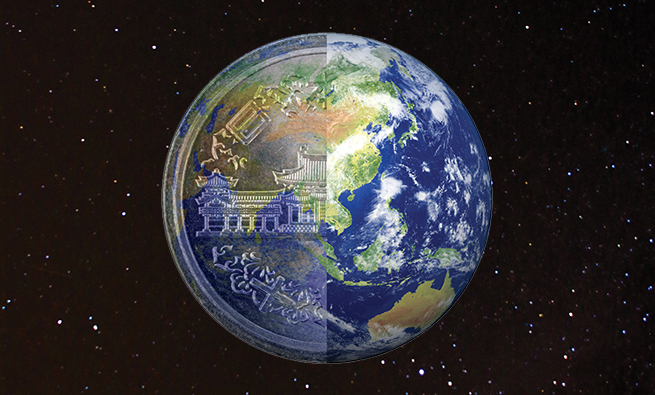 By attempting to synchronize nonfinancial capital (such as ESG) and equity spread (defined as ROE over cost of equity) and presenting the empirical research with the Eisai case study, we hope that there will be increased support of ESG/CSR projects for the sake of long-term value creation. To that end, we firmly believe that, as holders of the CMA® (Certified Management Accountant) designation ourselves, CMAs are the best proponent of ROE-ESG management accounting since we are trained to see beyond financial accounting to the real value created in organizations. Therefore, we call on CMAs to be pioneering thought leaders in connection with ROE-ESG management accounting and to work in their organizations to bridge the gap between nonfinancials and empirically provable value. NOTE: The English version of Eisai’s Integrated Report was released in late 2017 after the authors had finished their article and production work had begun. Hence this article relies on the 2016 version, but there are no material changes in Eisai’s data contained herein. For your reference, Eisai’s “Integrated Report 2017” is available at http://bit.ly/2CmwLzZ. Although there had been a grassroots effort to organize informal gatherings and activities among pioneering and loyal IMA members in Japan since 1972, IMA’s Tokyo Chapter officially received its charter in 2004 under the leadership of Osamu Nishizawa, Emeritus Professor of Waseda University, who became the Chapter’s first president. The Tokyo Chapter became IMA’s seventh international chapter. Waseda University, founded in 1882, is recognized as one of the top private universities in Japan. Its prestigious Graduate School of Accountancy (GSA) has continued its support of the Tokyo Chapter since the Chapter began, generously allowing the Chapter to use its meeting facilities and encouraging its teaching faculty to organize IMA events. Continuing the long tradition of support for IMA, Takashi Shimizu, also of Waseda University, became the Chapter’s second president in 2008. Under his leadership, major events have been organized on a regular basis. Through the encouragement of IMA staff, including Nina Michels-Kim and Chapter board members such as Dr. Shimizu and Dr. Ryohei Yanagi, CFO of Eisai Co., Ltd. and an adjunct lecturer at GSA, the Chapter worked hard and won the third-place ICMA Board of Regents Award among small chapters on the basis of the number of active CMAs in the Chapter, exam parts taken, exam parts passed, new CMAs, and new candidates. When Michels-Kim travelled to Japan to present the Chapter with its award, the face-to-face meeting helped spur efforts to explore opportunities for further collaboration between IMA and Waseda. This culminated in a Memorandum of Understanding (MOU), which was signed in the summer of 2016 to promote further best practices in management accounting education and IMA’s CMA® (Certified Management Accountant) credential in Japan. In spring 2017, Professor Shimizu, who was by then also the dean of GSA, organized a successful chapter event featuring Michels-Kim speaking on ethics and Professor Daniel Dolan, also of GSA, who spoke about accounting fraud in Japan. Professor Shimizu and Dr. Yanagi used the momentum gained from that April event to organize another live event on October 14, 2017. For the technical CPE sessions, Professor Shimizu talked about the Management Control System, and Dr. Yanagi discussed nonfinancial information and corporate value: the role of management accountants. In addition to an informal networking session, the annual members’ meeting and Chapter board elections took place. The well-attended meeting was appreciated by Japanese IMA members and CMAs. The new Chapter Board members are: Takashi Shimizu (president), Ryohei Yanagi (secretary), Zenichiro Ishibashi (treasurer), Shinichi Aoyama (vice president of membership), Keiichi Hasegawa (vice president of professional education), Kazuhiro Ohishi (director at large), and Ryota Machida (director at large). The Chapter is now organizing an event to take place in late February/early March 2018 featuring IMA President and CEO Jeff Thomson. For more information about the Tokyo Chapter, please visit http://tokyo.imanet.org. International Integrated Reporting Council, “The International Integrated Reporting Framework,” 2013; http://bit.ly/2o4FRhx. Japan Investment Relations Association, “IR Survey 2017,” 2017. Yoshikazu Tomizuka, “Are Non-financial Capitals Connected with Corporate Value? Empirical Research on Japanese Healthcare Sector,” Kigyo kaikei, May 2017, pp. 116-122. Ryohei Yanagi, Financial Strategies for Maximizing Corporate Value, DOYUKAN, Tokyo, Japan, 2009. Ryohei Yanagi, ROE Management and Intangibles, CHUOKEIZAI, Tokyo, Japan, 2017. Ryohei Yanagi, “How Are Global Investors Looking at Japanese Companies? Implications from the Global Investor Survey in 2017,” Kigyo kaikei, May 2017, pp. 108-114. Ryohei Yanagi and Takaaki Yoshino, “Relation between Human/Intellectual Capitals and Corporate Value (PBR),” Gekkan shihon shijo, October 2017, pp. 4-13. Ryohei Yanagi, CMA, CFM, Ph.D., is CFO of Eisai Co., Ltd. He is also Visiting Professor at Toyo University and Visiting Lecturer at Waseda University. In addition, he helped draft the “Ito Review,” a report sponsored by The Ministry of Economy, Trade and Industry (METI) in Japan to help improve the performance and corporate governance of Japanese companies. He has written many books and theses with respect to management accounting, corporate governance, and finance. A board member of IMA’s Tokyo Chapter, he can be reached at r3-yanagi@hhc.eisai.co.jp. Nina Michels-Kim, CMA, CSCA, is director of European Operations for IMA. She is also cofounder of Starling GmbH, a Zurich-based consultancy in digital strategy, social media analytics, and business intelligence. Prior to starting her own business, Nina worked more than 13 years in various financial planning, analysis, and controlling positions in the pharmaceutical industry. She is a member of IMA’s Switzerland Chapter and can be reached at nmichelskim@imanet.org.